There are currently 172 people online. 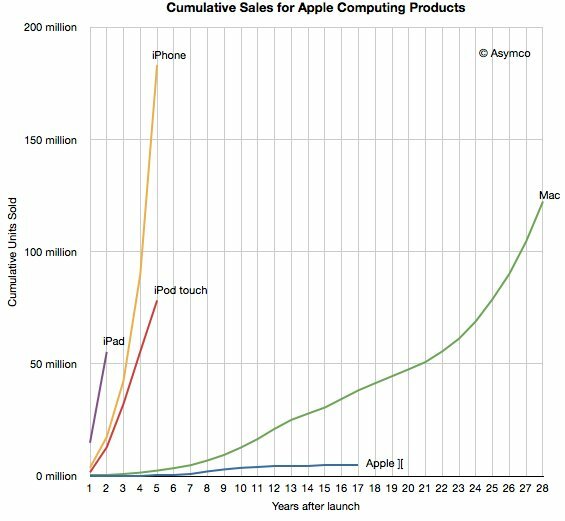 DailyTech came across some interesting statistics from Asymco regarding Apple's product sales. Asymco calculated that Apple iOS sales (iPhone, iPad, iPod Touch) now total 316 million, over 2.5 times as much as all Mac computers the company sold in the past 28 years! Asymco has offered a very interesting statistic that looks at the number of iOS devices sold versus the number of Macs sold by Apple. Macs have been on the market in various forms for 28 years. According to Asymco, Apple has sold 122 million Macs over the 28-year time span. Since the iOS platform launched, 316 million devices running the OS had been sold by Apple. That counts iPhones, iPads, and iPod Touch. One thing that isn't clear about these numbers is how exactly Asymco was able to determine the number of iPod Touches sold since that metric is bundled in with all other iPods which don't run iOS. Asymco claims that in 2011 alone 156 million iOS devices were sold putting the number 34 million above the number of Macs sold.